A middle-aged Lebanese man is helping to dye his elderly mother’s hair when, suddenly, the lights of the house shut off all at once, leaving them in darkness. Later, after the man yells at a neighborhood boy named Walid for playing in their yard, Walid sneaks back into the yard to retrieve his ball and, on his way out, deliberately tips over one of the mother’s giant flower pots and smashes it. When the man leaves his Ethiopian maid in the car to go get them both sandwiches, he returns only to find that the maid has disappeared. These moments, which capture the essence of daily life, are woven through Ok, Enough, Goodbye (Tayeb, Khalas, Yalla),the assured debut feature of longtime collaborators Rania Attieh and Daniel Garcia. At the start of the film, the man who lives with his mother goes through the motions of daily life with a permanent look of ennui on his plump, grizzled face. His relationship with his mother is the very definition of tragicomic, as are other aspects of his life – his pastry shop has no customers, his love life is nonexistent, and the lights in his house turn off seemingly at random. He and his mother bicker constantly, until one day she leaves for Beirut without telling him, and he is forced to adjust to life without her – and perhaps, even, to finish growing up. The man begins to search for companionship in the most unlikely places, but he soon proves unable to establish a relationship with any of the people he encounters – not with Walid, nor with a prostitute who sends him amorous text messages, nor with an Ethiopian maid who speaks no Arabic and, worse, won’t accept any of his offerings of food. The main character never manages to leave his state of arrested development, and his attempts to communicate with other people are funny precisely because they are so painfully awkward. Attieh and Garcia are merciless in their characterization of this man, which gives the film a wonderful sense of humor, but at the same time leaves him – and us – feeling a bit hopeless. Tripoli itself is given the same merciless treatment: a series of documentary-like interludes (with Arabic voiceover provided by Attieh) talk about different parts of the city and reveal it as a lonely and empty place. Ok, Enough, Goodbye’s location in Tripoli, Lebanon deeply informs its story. In a Q & A session she gave after the screening of the film at NYUAD, Attieh stated that she and Garcia wanted to comment on aspects of Lebanese society that had made an impression on them, ranging from people’s harmless and enduring need to show affection with food, to the common phenomenon in Lebanon of unmarried adult children still living with their parents, to the appalling exploitation of foreign maids in Lebanon. According to Attieh, the very different perspectives that she and Garcia brought to Lebanese society (Attieh as an insider and Garcia as an outsider) created the mixture of observations that they were able to translate into the tragicomic lives of the film’s characters. In the Q & A session, Attieh also commented on the technical details of the production itself: working as a crew of two, she and Garcia had to do everything by themselves, so in one sense, making the film was quite stressful. On the other hand, though, because they had no one to answer to, they had absolute creative control over every step of the production. They used their own camera, borrowed a tripod and sound equipment from friends, and worked well within their incredibly small budget. Despite all these restrictions, Attieh and Garcia created a funny, melancholy portrait of a city and the wandering, forlorn people who inhabit it. As for what it is next for the dynamic duo? 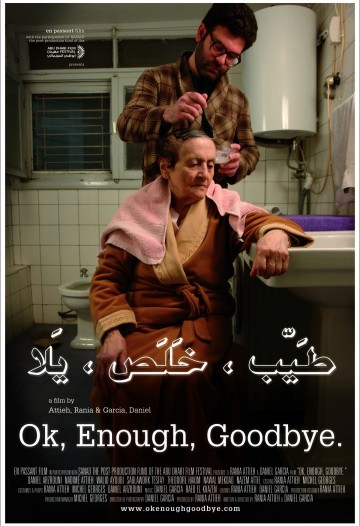 During the summer of 2012, Attieh and Garcia shot their second feature in Texas, thereby reversing the roles of insider/outsider that they had taken in Ok, Enough, Goodbye. With the help of five of their friends as crew, they were able to halve the production time to twenty-one days instead of forty. The film is currently in post-production. Attieh claims that she and Garcia keep saying “never again” to the prospect of making more films the way they made their first one – that is, without a script, without pre-production, with very little crew, very little money, and a whole lot of stress. However, they have obviously found a system that works for them, and that seems to be their preferred style of filmmaking. Indeed, what I find most interesting about Ok, Enough, Goodbye is not the film itself – although it certainly was a pleasure to watch – but rather the success it has achieved despite its low budget and unorthodox production. (The film won the “Best New Director from the Arab World” award at the Abu Dhabi Film Festival in 2010.) Attieh and Garcia are wonderful examples of how to subvert the conventional system of filmmaking and still succeed.